Automotive sunroofs are operable or fixed roof openings with a retractable glass or fiber panel that permits air and light to penetrate the passenger compartment. Automotive sunroofs, which are either manually operated or motor driven, have witnessed vast developments in the past few years and have moved on from being mere a styling feature in premium cars to becoming accessories with numerous applications; rooftops housing solar panels, for instance, are increasingly making appearance in electric and hybrid cars, complementing rechargeable batteries to give vehicles more power to cover extra miles. Rising income levels of consumers across emerging economies such as India and China have increased the spending capacity of automobile buyers, which is compelling automobile manufacturers to introduce vehicles with an additional aesthetic value. Transparency Market Research estimates that the global automotive sunroofs market was valued at US$4,796.0 mn, in terms of revenue, in 2016. The market is projected to expand at a CAGR of 11.8% during the period between 2017 and 2025 and reach US$12,935.1 mn by 2025. In terms of the most popular types of sunroof fitted in automobiles, the report segments the global automotive sunroof market into in-built sunroof, tilt and slide sunroof, panoramic sunroof, top-mount sunroof, pop-up sunroof, and solar sunroof. Of these, the segment of in-built sunroof is presently the leading contributor of revenue to the global market. The segment had a revenue valuation of US$1,588.2 mn in 2016 and is expected to retain its position as the leading revenue contributor to the global market throughout the forecast period, exhibiting a promising 11.8% CAGR from 2017 to 2025. However, the segment of panoramic sunroofs is expected to dominate in terms of growth rate over the forecast period. The rising consumer preference to luxury cars with wider panoramic view will bolster the demand for panoramic sunroofs in the next few years. The segment is expected to exhibit a 13.5% CAGR over the forecast period and reach a valuation of US$2,607.1 mn by 2025. Europe, being world’s leading producer of vehicles, held the position of the dominant regional market for automotive sunroofs in terms of revenue in 2016. The region accounted for a massive 33% of the overall market in 2016 and witnessed high demand for a variety of sunroofs in the U.K. and Germany. Although the market in Europe will continue to be the leading contributor of revenue to the global market throughout the forecast period, it will suffer slowdown owing to weak economies and the steadily shifting manufacturing bases to Asia Pacific. Following Europe, the Asia Pacific market for automotive sunroofs accounted for over 26% of the overall market and is region is expected to dominate the global market in terms of rate of growth over the forecast period. 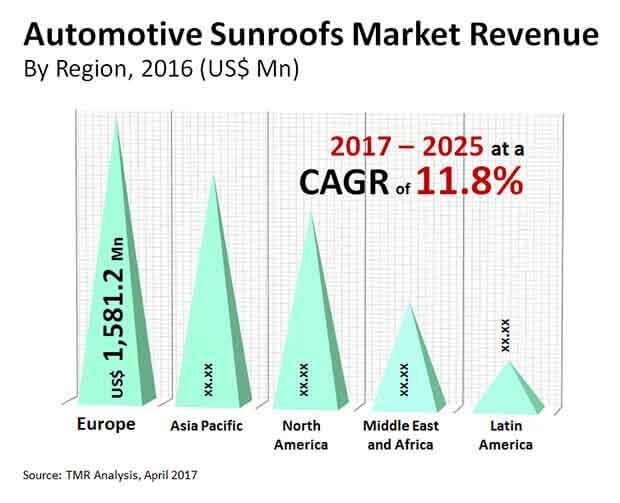 The regional market for automotive sunroofs will expand at a promising CAGR of 12.6% from 2017 to 2025, with emerging economies such as India and China emerging as the most lucrative markets. The automobile sector in the North America region is expected to witness steady growth, on account of which the automotive sunroofs market is also expected to record steady growth during the forecast period. Middle East is estimated to witness an exuberant growth in the automobile sector, with car sales in the region expected to outnumber that of North America by 2020. This is expected to drive the demand for sunroof market in the Middle East. The global market for automotive sunroofs features a large number of public and private players. Some of the leading players operating in the market profiled in the report are Aisin Seiki Co Ltd., Inalfa Roof Systems Group B.V., Inteva Products, LLC, Webasto SE, Mitsuba Corporation, Valmet Automotive Inc., NSG Pilkington Group, Johnan America Inc., and Yachiyo Industry Co.Ltd. The automotive sunroofs market is anticipated to grow at a significant pace over the forecast period of 2017-2025. An automotive sunroof can be defined as a fixed or operable opening in the vehicle roof that permits the entry of light and air into the vehicle. Automobile sunroof market has become highly competitive with new variety of sunroofs and breakthroughs in the leakage problems that turns out to be one of the major issues in sunroof openings. With the growing demand for comfort and safety systems in vehicles, the demand for sunroofs in automotive vehicles has increased significantly. Sunroofs provide better air circulation within vehicles and also offer superior brightness and illumination during daytime, which in turn increases the comfort level of the passengers. OEMs have started to offer built-in or optional sunroof systems to mid segment cars in addition to luxury or premium vehicles. Due to rapid economic improvement, growth in GDP, reduced inflation rate and downward trend in fuel prices, there is huge demand for premium vehicles globally. Growth in production of these vehicles in developing countries of Asia Pacific is mainly characterized by increasing domestic consumption, rise in disposable income, low ownership rates and presence of cheap labor in India and China among others. Moreover, recovery of macro-economic conditions in developed countries of North America and Europe post economic recession in 2010 is another factor responsible for the growth of the premium car segment. These factors are largely responsible for the expansion of the sunroof market as the growth of the sunroof systems is directly related to the advancement of the passenger vehicle segment. High maintenance cost, incidences shattering of sunroofs are some of the major restraining factors of this market. Moreover, the sunroof systems have holes and drains that can cause water clogging and leakage into the vehicle. This requires frequent maintenance and thus adds up to the maintenance cost. The global automotive sunroofs market has been segmented based on material type, glass sunroof and fiber sunroof. The glass sunroof market has been segmented into laminated glass sunroofs and tempered glass sunroofs. The sunroof type market has been further segmented into in-built, tilt and slide, panoramic, top-mount, pop-up, and solar glass sunroofs. Glass is the most popular material employed for manufacturing sunroofs. Glass sunroofs offer better transparency, and an open and spacious atmosphere, resulting in high consumer interests in them and higher demand in the glass sunroof market. Pop-up, tilt and slide, built-in, top-mount, removable and panoramic are the most commonly used sunroofs in automobiles. Pop-up sunroofs are one of the oldest sunroofs systems in use. They have a very basic construction with a vent in the rear and a removable glass panel. These sunroofs are manually operated. The report offers an overview of the factors that drive and restrain the market growth of the automotive sunroofs market. This report highlights the current market trends of the automotive sunroofs market along with future anticipated market growth opportunities during the period from 2015 to 2025. Moreover, information related to key players operating in the market along with their market share and key strategies adopted to maintain their leading position is also provided in this report. The report also contains the present market size of automotive sunroof market in terms of revenue (USD Million) along with predictive forecast from 2017 to 2025. The geographical segmentation includes the North America, Europe, Asia Pacific, Middle East and Africa (MEA), and Latin America region. Europe holds the largest market share followed by Asia Pacific and North America. Asia Pacific is anticipated to grow with the fastest growth rate. Some of the major players operating in the automotive sunroofs market include includes Aisin Seiki Co. Ltd. (Japan), Inalfa Roof Systems Group B.V. (Netherlands), Inteva Products, LLC. (Troy), Valmet Automotive (Finland), Johnan America, Inc. (U.S.), and Mitsuba Corporation (Japan), among others.